Simtable Flood & Storms software module includes flooding from dam breaches, hurricane inundation and other surge models. Wildland fire burn scars can be modeled to see impacts of erosion and silting on hydrophobic soils. Water can be generated as a point source or as a uniform rainstorm with configurable depths per hour. 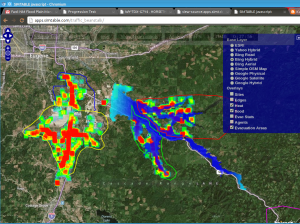 Simtable Flood & Storms module allows users to visualize build up of flash flooding. Real-time stream and time gauges can be added for situational awareness during incident command. All incidents include the ability to evaluate evacuation plans with simulations of local populations’ housing layer and local road networks. The dynamic flood inundation mapping runs flood simulations and creates maps during a current and forecasted flood using real-time data. Inundation maps can be used for flood risk analysis, environmental and ecological assessments and damage recovery. Aiding communities in identifying immediate risks during a flood can help protect lives and property.